You need to adjust timing on a car for many older models (those which have a distributor) to maintain the best possible performance. When timing is neglected, you can suffer poor gas mileage, less power when you hit the gas and eventually degrading problems that might keep the engine from running. While you can get a mechanic to adjust the timing for you, it’s a fairly easy process, and you’ll stand to save a lot of money when you learn to do it yourself. Before you jump in, double check your vehicle. Most manufactured since the early 90s will have an electronic ignition timing and do not require this maintenance. In those cases, an scan tool would be a better investment. Before we learn how to set ignition timing, we require a short lesson on how engines work. To put it simply, an engine works by using small explosions of gasoline to make pistons move up and down. That motion spins the engine which in turn rotates the gears and spins the wheels. This is ignoring a lot of other processes that happen at the same time, but it’s the primary function of your engine. To ignite the gasoline, we use electric spark plugs, so when we refer to a vehicle’s timing, we’re talking about making sure the spark plug fires at the best possible moment. More specifically, we want to fire the plug when the piston is at its peak in the up-and-down motion. If this is a little hazy, it’ll make more sense when we talk about the whole engine cycle. To keep an engine running, it undergoes four steps (called strokes) in rapid succession. Those strokes are called intake, compression, power and exhaust. During intake, air and fuel are drawn into the cylinder for combustion. The compression stage is when the piston applies pressure to the air-fuel mixture. The pressure is necessary to get a nice explosion instead of a slow burn, and this is the key to getting propulsion out of the process. The air is fully compressed when the piston is as high as possible, and this is called “top dead center.” This is the ideal time for the spark plug to fire. The next stage is power, and it is when the explosion of gasoline forcefully pushes the piston back down to rotate the engine. The last step is exhaust where the byproducts of the explosion are ejected to make way to start the process anew. 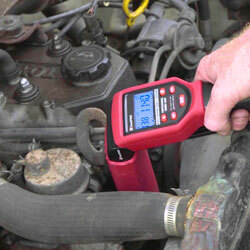 To recap, we check the timing to make sure the spark plug is firing when the fuel mixture is fully compressed. This gives us the most power for each ignition, but over wear and tear can cause the plugs to fire slightly too soon or late. This is the reason for timing maintenance. Before we jump into adjusting the timing, we need to know the standards. Timing adjustments are measured in degrees. You will advance or move back your timing by a few degrees during this process. You can find these numbers on the harmonic balancer (also called the flywheel). They’ll be notched in ruler fashion and will be your guide to precise adjustment. You’ll want to compare the numbers you see to manufacturer recommendations. They’re a little different for every model, and you probably won’t find this info in the owner’s manual. Instead, refer to manufacturer websites or listings from professional mechanics. At last we’re to the inductive timing light (or gun). You can set it up with the engine off to help avoid accidents. The gun should have a few plugs or clamps. You want to attach the corresponding cables to the power and ground terminals of the car’s battery. A third wire will attach to the number one spark plug wire. Make sure you have the right plug as this will majorly impact your timing readings. When everything is attached, start the car and let it idle. Shine the light at the timing numbers on the marks on the flywheel and you’ll see a number. The timing gun works on a simple principle. When the spark plug fires, the current tells the gun to flash. This strobing effect should cause one of the timing numbers to appear steady as the engine runs. Compare the number to manufacturer recommendations. Once you’ve checked the idle timing, you want to rev the engine (a friend is necessary for this part). While in neutral, rev the engine up to approximately 3500 RPMs. As the engine turns faster, the timing will change. This creates a timing range, and you want to compare the whole range to manufacturer listings. Now that you have the number, you know what adjustments to make. Learning how to advance timing (or regress it) is the easy part. Loosen the distributor bolt so that you can barely twist it. You won’t be removing the distributor, but you will be rotating it. When you spin the distributor housing, you adjust ignition timing. Make your adjustments in small increments until the timing is in the correct range. The first time you do it will take some practice, but you’ll get a feel for it pretty quickly. At this point you might be wondering which way to rotate the distributor, but that actually depends on the car. As a rule, you advance the timing by rotating it opposite the rotor. If the rotor turns clockwise, you want to spin the distributor counterclockwise if the engine needs to advance. If this feels confusing, you can just use a small twist and a little trial and error. When you’ve made adjustments, tighten the distributor and make sure vacuum hoses are attached and check the timing again. Rinse and repeat until the numbers are correct. That’s it. 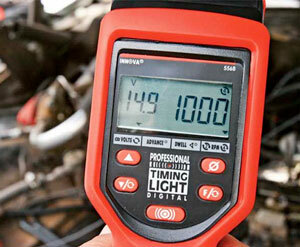 Now your engine timing has been optimized your vehicle will be running at its best! This is a good overview. Any specific model you recommend?